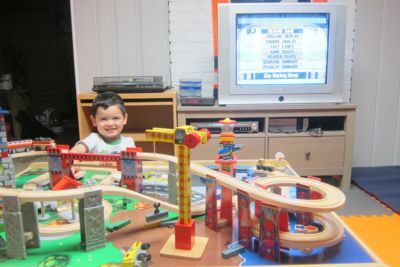 For all things railroading and trains in Connecticut, check out CTMQ’s Railfan Depot! I have to preface this page with something very, very rare here on CTMQ. A Mommy/Lifestyle/Foodie/Shill-Blogger Disclaimer! The very thing I hate. 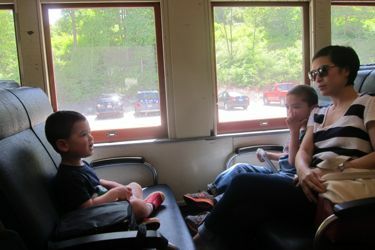 So bear with me as a choke this out: I received free entrance onto the Naugatuck Railroad for myself, my wife, and my two sons. (And here’s part they always write that I hate the most…) However, all opinions of the Railroad Museum of New England are my own! Don’t be sad, we’re going on a train ride! Phew. That was difficult for me. If you ever want to fun exercise, try to find a shill blogger saying anything negative about a place where they got free food or entry or whatever. Whoever came up with the “all opinions are my own” schtick, and convinced thousands of shill bloggers it made sense, is the worst person ever. I’ll spare you the nitty gritty, but this situation was two years in the making. That’s right, the President of the museum, Celeste Echlin, reached out to me in 2012. She’d been a long-time readers of this website and extended me an invitation to her museum and train. I thanked her and told her that I don’t accept free stuff on principle. 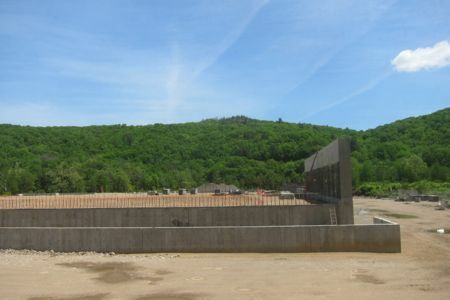 Even though this is a non-commercial site. I’m weird. Two years passed and we corresponded a few more times and I finally said, “Eh, why not.” With my older son’s special needs, we are often forced to leave ticketed pursuits far earlier than we’d like. So, after two years of sitting on this – and letting our younger son grow into his love of trains – I accepted Celeste’s kind and generous offer. And we went to Thomaston. As we drove through downtown, I remarked to my wife, “I don’t think I’ve ever been in downtown Thomaston before.” That in itself is a rather remarkable statement. While I¹ve certainly been to every town in Connecticut many multiples of times (see: This website), I haven’t been everywhere in every town. But I have been to most, if not all downtowns – and “downtowns.” I can’t think of any I haven’t been to quite frankly, now that I’ve nabbed Thomaston. I should also note that downtown Thomaston is quite pretty and welcoming in its post-industrial southern New England Sure We Have Opioid Issues And Stuff But That’s Hidden Behind Our White Steeple Churches and Perfect Fall Foliage kinda way. The Railroad Museum of New England is a rather interesting museum. 99% of what a typical visitor experiences is the train and train ride. The more traditional museum, housed in the more-spacious-than-you’d-think Thomaston train station, is fairly sparse. But really, the old brick station itself is the showcase here, not necessarily the stuff inside it. The Victorian station was built in 1881(!) and after years of neglect and arson and vandals, it has been (mostly) restored to its former glory. It has a ways to go yet, and the museum is always looking for volunteers and money to help them with their goal. The museum is a not-for-profit educational and historical organization that dates back to January 1968. 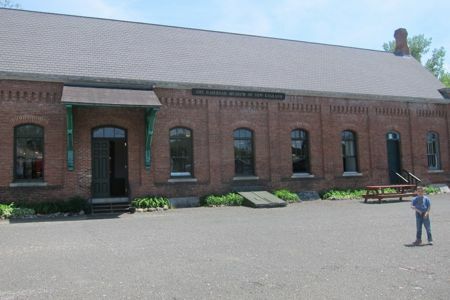 The mission of the Railroad Museum of New England is to tell the story of the region’s rich railroad heritage through our educational exhibits and operation of the Naugatuck Railroad. The museum concept is more than artifacts, it’s also a story of the region and the development of society around the railroad. Celeste mentioned a lot of things in her emails about our visit. Very informative and kind things. Unfortunately, like I’ve said, I’m just not ever comfortable with the whole “Do you know who I am” thing. 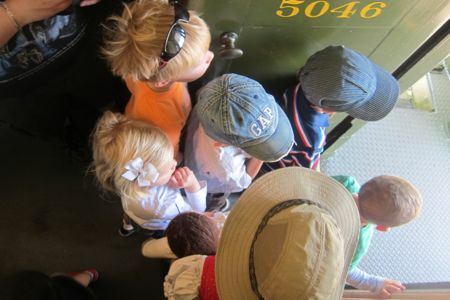 As a result, her promises of a tour of the train’s engine went unfulfilled – but very much appreciated! I told you she was nice. Our tickets for the trip were also sort of vintage. 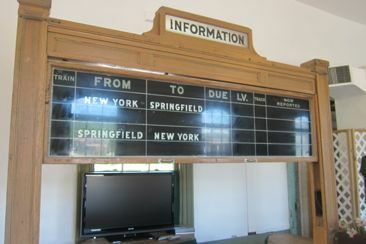 The stations listed on it are the ones that were operational back in the day. Like, way back in the day when calling a place “Campville” or “Burrville” or Lofty Crest” made sense. This train line, apparently, used to travel from Winsted to Bridgeport – which is, of course, the length of the Naugatuck River Valley. According to my ticket, there were 22 stops along the way. I love these tickets for some strange reason. The conductor guy came through the car, in full conductor regalia, and punched all four of our tickets as if we were on a real train ride. Oh wait! 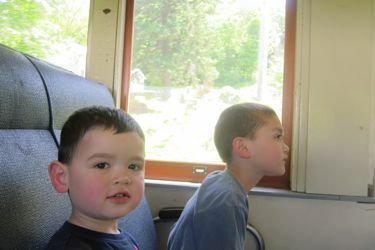 We were on a real train ride! And that’s the coolest part of this museum. 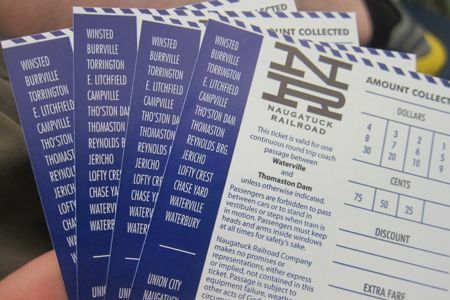 Real tickets, real train, real conductor…. you get the point. And real people took real trains from Winsted south from 1849 when this line open until 1958. Passenger service stopped north of Waterbury in at that time, but the freight still traveled between Waterbury and Torrington at least. The state bought the line in 1982 for some reason, but the whole thing was shut down in 1995. As the train began to get going, I got that feeling in the pit of my stomach. 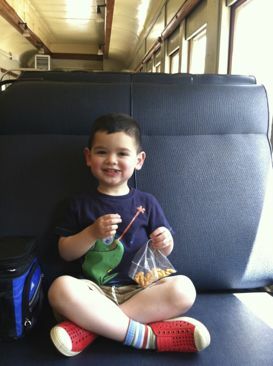 Calvin, 3, had never been on a train before but he was excited and eager about the adventure. 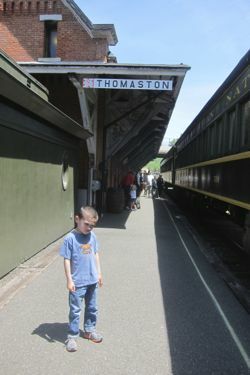 We had gone to the Danbury Railway Museum the weekend prior, to give him a feel for what the inside of trains look like. He’d be fine. Damian’s always been good in the car, but he’s been strapped down. 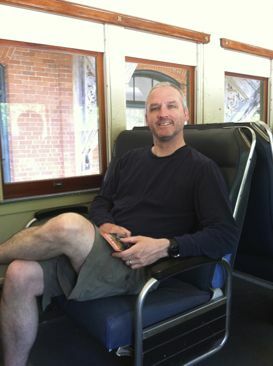 On a train, with little stimuli and the ability to roam free… yeah, we were taking a risk. We sat in the middle, right next to our guide. Unfortunately, there was a major SNAFU during our trip – the microphone/PA system was not working. While disappointing, I could at least hear most of what was said – though an old diesel train on rickety tracks did make it quite difficult. 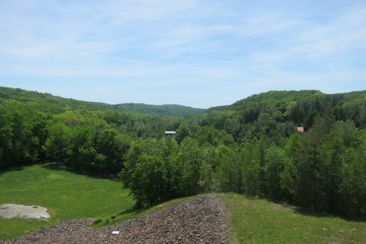 The train headed south from Thomaston. 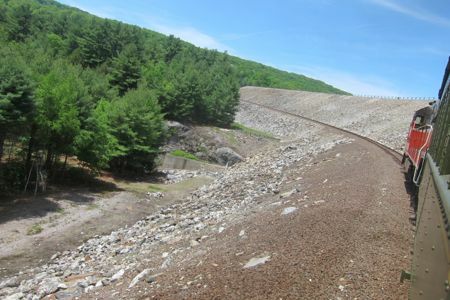 The tracks, as you’d imagine, follow the Naugatuck River down the valley it created thousands of years ago, which most people now associate with the beautiful route 8, powerhouse high school football teams and the hardscrabble, hard working union Valley towns. The first half of the trip south is lovely. It travels through woods and along the river, crossing it a couple times. The train passed under Reynolds Bridge, which has a small place in history. First of all, it’s quite a large open spandrel concrete bridge and it is listed on the National Historic Registry. If you’re into bridges, you’ll enjoy this. 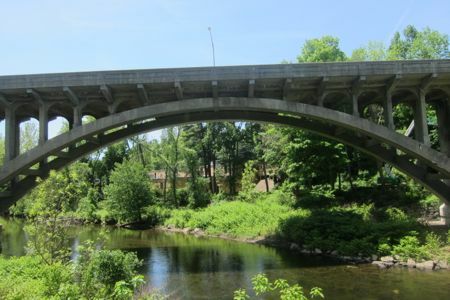 I could be wrong, but I believe I heard our guide say that the Reynolds Bridge was the only bridge along the Naugatuck River to have survived the flood of 1955. Or at least one of the few. Or something. It’s an impressive bridge. On we traveled and the boys were doing well. 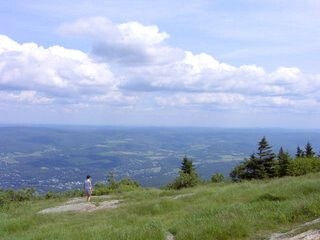 We passed an area called Jericho, which I’m guessing is/was in Watertown, as I’ve hiked the Jericho Trail near here. Up next was Lofty Crest, which is a lovely historic place name – one which I wish still existed. It was around that point that we traveled west of the Whitestone Cliffs. While this picture is the opposite of impressive, you can sort of make them out in the distance. They look a bit cooler when you’re hiking up them, as I did here. For me, on the train, I was a little excited to see them from afar. I was quite alone in this feeling. 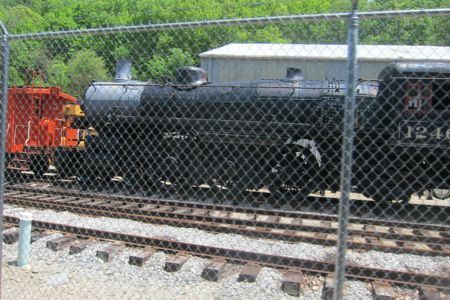 After this bit of scenery, the train passes through the museum’s expansive historic equipment collection. It’s basically a patch of land full of old trains. As you can imagine, housing a bunch of old engines and rail cars takes up a lot of space. There aren’t too, too many here, but the museum’s website claims a LOT. I would therefore gather that some are on loan, some are housed elsewhere, and some are back up near the station in the Volunteer Shop. 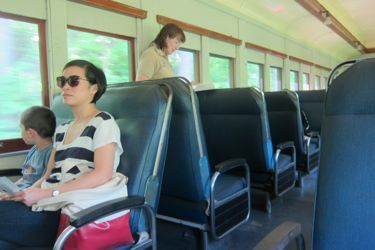 We crept by the various old train cars while the wonderful guide tried valiantly to make her voice heard over the din. Fortunately, if any of us who couldn’t hear her really wanted to learn about these train pieces, the RMNE’s website gives an incredibly thorough description of each and every one. I mean, who in the world doesn’t know that original style drop equalizer trucks are better known as AAR-B trucks? Cripes, my three-year-old knows that. Our heavyweight coaches were originally built for the Canadian National Railway and used in regular mainline service. Built between 1919 and 1923, many were retro-fitted with ice-cooled air conditioning in the late 1930s. 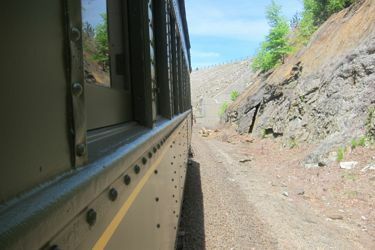 The cars were regularly used on trains between Montreal and New England cities such as Boston, Portland, Maine, and Springfield, Mass. After being replaced in the early 1960s by modern passenger coaches, they settled into their new role in Montreal commuter service starting around 1969-1970. Each car is 82 ft. long, average weight w/o A/C is 145,000 lbs each. After serving a long career in Montreal, the coaches were retired and put up for sale in 1991. 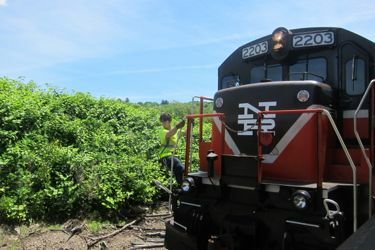 The cars currently serving on the Naugatuck Railroad were donated to RMNE by benefactor Thomas V.G. Brown in 1997. After the museum’s historic yard, our route took us through some gritty areas. 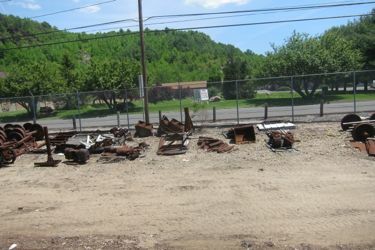 The views near the turnaround point do not make the RMNE’s brochures. We had to go this far south – to Waterbury – in order to reach a section of track for the ever-exciting engine change! You know what? I liked that the train trip isn’t all river valleys and white stone cliffs. The history and import of trains in the US absolutely includes urban and industrial areas. To pretend otherwise is deception. The RMNE doesn’t front; they tell it like it is and find the gems among the rusted trucks and empty factories on the route. I dig that, I really do. 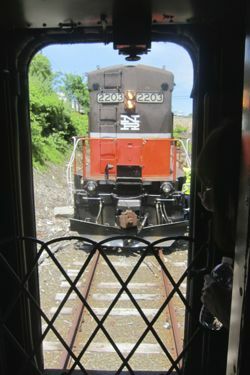 At the end of our run south, the engine moved around to the “other” end of the train – our end. The provided an opportunity for the kids to rush to the back of the passenger car and watch the engine back onto our car. 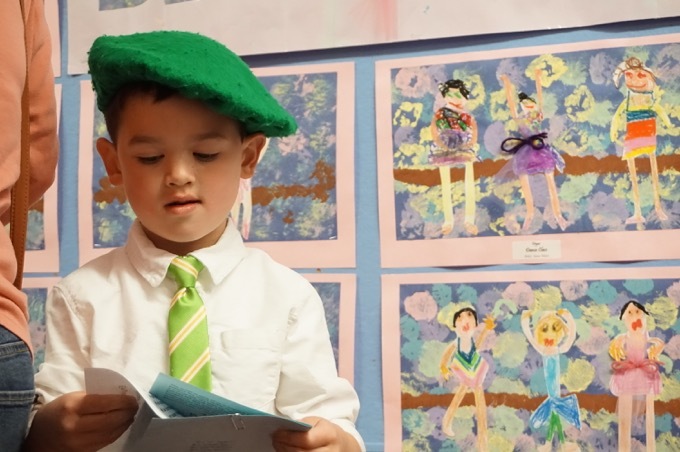 So there I was… 6’3″ old guy me with 10 preschoolers at my feet, including my own. And watching Engine 2203 back its old FB-2 trucks up and latch on was rad. For real. On our trip back north, I excitedly showed Hoang the 1936 snow plow car we had passed earlier. I found it fascinating that the museum still uses this thing to clear the tracks with its pneumatic wings. She just stared at me. 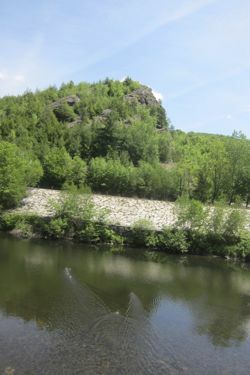 Our trip passed through the station and continued the short trip north to the Thomaston Dam. This is, in a way, the highlight of the trip. (I enjoyed seeing the Mattatuck Trail crossing as well.) The train slices through the massive earthen berm built by the Army Corps of Engineers in the late 1950’s. I’m sure this bit of the trip is stunning in October. By this point, I was ignoring my children. Calvin had eaten enough snacks for 10 kids and Damian was sleeping. 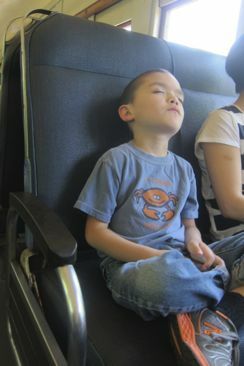 (This is typical of him during the middle of the day, not an indictment of the museum!) I was lost in the lore of the train and the dam. I was having fun. Alas, we returned to the station and had to wake Damian up. This is never a fun thing to do. I’ll spare you the details, but his waking tantrum forced us to make our way very quickly through the station exhibits and the showpiece cars near it. 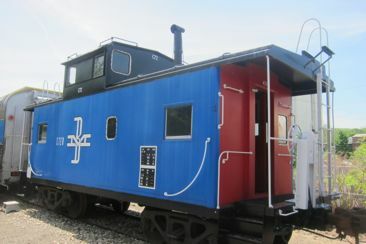 This was unfortunate, as Calvin really wanted to spend time in the old Boston & Maine blue caboose, built in 1957. Oh well, such is life with his brother. He’s already used to it. And besides, we weren’t done with trips for trains. No, after a picnic lunch on the museum’s grounds, we headed down into Waterbury to visit our friends the Silvas. 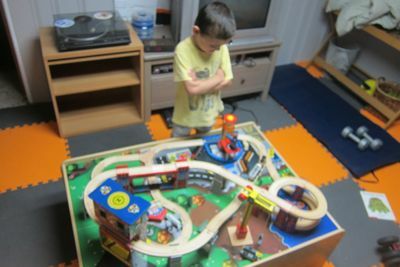 I went for the fantastic – at the time – home-brewed beer at Ed Silva’s Lasting Brass operation (which is now a fantastic professional operation), and the boys went to pick up the awesome train table to add to their basement lair. 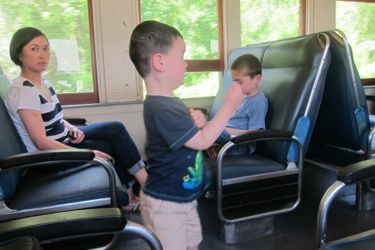 If you like trains and train rides and train history, you have several options in Connecticut. All have their charms, from Essex to East Haven to Danbury, Thomaston, Windham, and East Windsor. The irony of these cool train and trolley rides is that our “real” trains (MetroNorth and Amtrak) are horrendous. Stick to the museums like the Railroad Museum of New England and you will actually have a good time, not die, and not get stuck because an ancient bridge in Norwalk won’t work.